Turning your child’s inner potentials to lifelong skills. Dr. Maria Montessori believed that children learn because they are motivated by a natural curiosity and love for knowledge. Children develop most of their basic attitudes and values about life and learning during their preschool years. Norbeck Montessori students “learn how to learn” via the time-tested, trusted Montessori curriculum. At our Montessori preschool and kindergarten in Rockville, Maryland, our instruction includes the areas of Practical Life, Sensorial Development, Language Arts, Mathematics, Science, and Social Studies. Our Montessori curriculum stresses self education and training through the use of movement and senses. We also offer a Transitional Two’s program, summer camps, extended day programs, and Spanish Immersion classes! The best way to learn about Norbeck Montessori is to come visit us! Schedule a tour of our Rockville preschool today. At Norbeck Montessori, we want children to learn and grow by providing them with meaningful, real, practical activities for use in life. The lessons found in the Practical Life area of the classroom provide those real-life experiences for children. In addition, these lessons develop independence and promote concentration as well as a sense of responsibility. Both large and small muscle development are involved, helping a child to have control over his or her body. These Practical Life Montessori lessons may include sewing, pouring liquids, sweeping, dusting, polishing, and table washing. 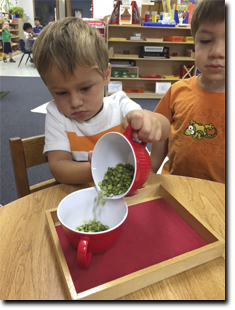 At the early preschool age, children are becoming keenly aware of their 5 senses. The Sensorial Education area of our Rockville Montessori classroom helps children develop and sort out all the impressions they are feeling with their sense. Dr. Montessori believed that without the opportunity for a child to explore through sensorial activities, the child would be less intelligent. 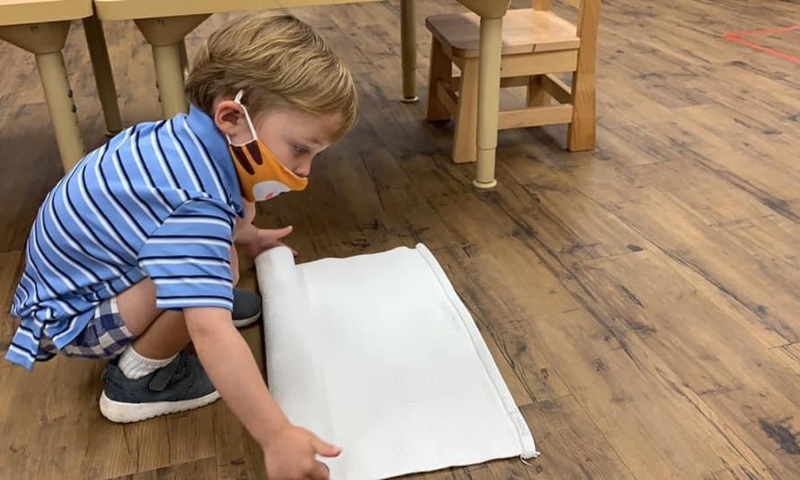 Through the use of sight, touch, taste, smell, and sound, a child at Norbeck Montessori begins to explore, observe, and become aware of the physical world they are in. Sensorial activities help the preschool child learn to discriminate among the various senses and feel a sense of order, and also help prepare him/her to be a logical, aware, and perceptive person. 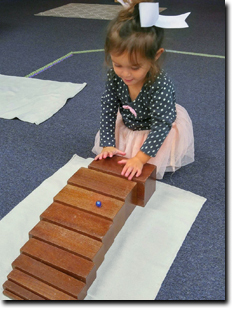 The sensorial materials at Norbeck Montessori in Rockville assist the child in developing an understanding which forms the basis for abstract thought. Contact Norbeck Montessori in Rockville, Maryland today or call 301-363-7009! One of the most amazing things about preschool children is that there is no need to ‘teach’ them language—we only need to organize and provide the content and the child will absorb it. at Norbeck Montessori, we prepare the proper environment that enables them to develop language on their own. In our Montessori classroom, it’s rarely silent during a work cycle! The children are constantly conversing and listening to both friends and teachers for exposure to new vocabulary. Children in our Montessori preschool and kindergarten classrooms learn to write and read faster and with more ease by exposing them to the phonetic sounds vs. letter/symbol recognition. As language becomes more elevated and refined, more structured reading and writing lessons are introduced. Children will start with lessons such as the Sandpaper Letters and the Moveable Alphabet, then move on to three-letter Word Cards and eventually to reading and writing stories independently. We believe in helping your child build a strong foundation for education and growth. Call Norbeck Montessori at 301-363-7009 to learn more! 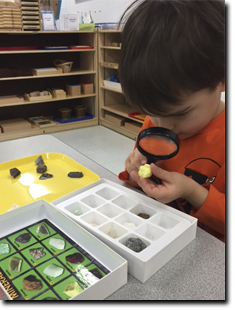 Mathematics teaches our preschool students a different way of looking at the world. 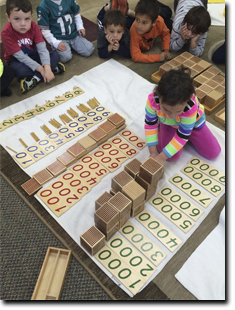 Our Montessori Math curriculum provides a language for understanding and expressing measurable relationships. Our preschoolers have the capacity to reason, calculate, and estimate. They are naturally conscious of quantity and counting, whether it’s pebbles on the beach or cookies for dessert. The mathematics materials at Norbeck Montessori build upon each other in increasing complexity. Preschool and kindergarten students start by learning quantity and then the symbol that quantity represents. This eventually leads to a child incorporating quantity and symbols to perform more and more complex mathematics operations. This Montessori process allows for the child to experience the thrill of discovery as part of a natural progression. Schedule a tour of our Montessori school today! We invite families Silver Spring, Aspen Hill, Gaithersburg, Shady Grove, and nearby to come and explore. The Culture areas of Norbeck Montessori’s curriculum include a variety of subjects like History, Geography, and Science. Our Montessori preschool’s Science curriculum is designed to pique a child’s natural curiosity and help them discover answers to their “why” and “how” questions. Science also helps students follow a simple thought process: question, test, observe, conclude. Norbeck Montessori in Rockville incorporates the exploration of earth science, physical science, biology, botany, and zoology into the everyday experiences of the child. Learning, especially in the geography and history curriculum, enables children to make sense of the world around them. At Norbeck Montessori, we introduce children to the broad concept of the world, then narrow it down to various land and water formations. We study everything from individual cultures, continent maps, landmarks, capitals, and flags. History in the Montessori classroom focuses primarily on the passage of time, which is a difficult concept for children to grasp. At Norbeck Montessori, we teach this concept in a way that makes it understandable and fun! We start by discussing seasons, then incorporate the months of the year, days of the week, hours of the day, and finally getting into telling time. The area of Culture is one of the most fun and interesting areas for all our little Montessori preschool and kindergarten learners. 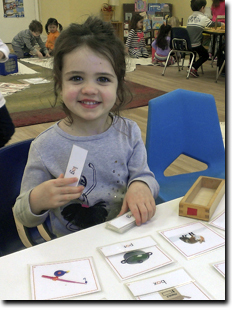 Come see our Montessori curriculum in action! Visit Norbeck Montessori in Rockville today to learn more about our preschool and kindergarten programs.